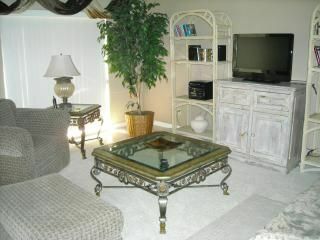 Professionally decorated 3 bedroom 2 bath condo across from heated pool and spa. Short walk to the clubhouse and first tee. Ted Robinson designed golf course and 25 Championship Tennis Courts. Across the street from The River. Excellent shops, restaurants and several movie theaters. Drive about five minutes to the McCallum Theater, Street Fair, Westfield Mall and upscale El Paseo fashion district. We Lived in Rancho Mirage Cove at the time we received an invitation to the opening of sales at the Resort of Rancho Las Palmas. We thought we would go see what was happening. Little did we know people had been camped out waiting for a chance to buy. You were given a number and if it was called you had a chance to a buy a condo. Our number was called and we picked this house. We have never been sorry!! We have owned this property for 38 years. We think this is, without question, the best location in the entire desert. The pool is across the street , there are tennis courts, a golf course, A mall, the River with shops and great restaurants. A well respected hospital, many great doctors, big box stores galore, the Living Desert, high end stores on the famous El Paseo and more great restaurants. What more could you ask for? 2-car garage with automatic door opener. WiFi, Cable TV, and DVR. Fitness room at club house. Ice maker and water door. Pool across the street with jacuzzi and large pool at club house. Fully furnished 3 bedroom condo. King size bed in Master bedroom, Queen bed in second and third bedrooms all mattresses box springs and bedding new in 2016. Large closets. Cable TV, Internet connection, CD/DVD. Fully equipped kitchen all Samsung appliances purchased in 2016. Both bathrooms completely remodeled. Patio with built in gas BBQ. GREAT HOLIDAY IN THE DESERT!!! We are so happy to have such a great review. We strive to please our guests and make sure they enjoy their stay with us. We do think our location is terrific! We were very pleased with the condo. It is located in a very nice country club community. We were visiting our son that was stationed at 29 Palms marine base and it was only about an hour and a half drive. The condo was very comfortable and spacious for my husband and I and two adult children. The owners have it well stocked so we did not have to buy anything extra but food. Very rare to fine that in rentals. We were even able to use the garage. We really enjoyed picking fruit for breakfast every morning in the backyard. It also has a nice patio with grill to sit on. There is also a community pool across the street for you to use. The condo is also centrally located to restaurants and grocery stores. I would not hesitate to stay here again. I highly recommend this condo for your stay if you are planning to visit the Palm Springs area. Cindy was quick to answer any of our questions and a pleasure to work with. Would stay here again in a heart beat. Stayed w/ wife and two older teenagers who appreciated having their own room. Access was simple and easy. Pool was 30 second walk across the street. Great mall w/ great dining options right outside the development. Right in the middle of Coachella Valley - easy access to Indian Wells or Palm Springs. Everything worked in the home and not sure you could ask for anything more. Highly recommended. Dear Michael, I am so pleased your family enjoyed your stay at our condo. We truly feel it is the best location in the desert. We are so fortunate to be so close to the mall and El Paseo yet right across from The River with movies and restaurants. Then, of course, we are in the middle of a beautiful 27 hole golf course. I hope you and your family will be able to stay with us again soon and thank you for your lovely review. Place was really nice and comfortable! Great modern appliances. Give Cindy a call for instructions before your check-in. Security can be a bit inconsistent as to how strict they are on guests, just get everyone on the list at day 1 and it should be fine. Only thing to improve on is there was only one dishwashing tablet and there was no shampoo for the ladies. The pan might be due for a replacement. Very comfortable, spacious unit in an ideal location (we were able to walk to just about everything we needed). Owner was really friendly & helpful. It’s not luxurious, but good value & well maintained. Loved picking fresh grapefruit & oranges each morning! We stayed here two years ago. The condo owners were great and the condo location was excellent for the activities we enjoyed. Our only concerns then were the 40 year old electric stove and the comfort of one of the beds and the fact that the condo backed on to the tennis courts. This time all appliances (kitchen and laundry) have been replaced with new. We especially liked the new gas range/oven and the above range microwave. The toilet in the main bathroom was also new and worked much better. A 2" memory foam had been added to the beds, greatly improving the comfort. The place looked liked it had been freshened with a new coat of paint. A DVR was added to the main TV. Overall a significant improvement from our last visit. I would give the condo a 4.5 star rating if allowed (I rarely give 5 stars to anything). The condo wasn't perfect but excellent value for the money. Our guest was correct, we did a great deal of remodeling since they were here. All the beds were replaced. All the appliances were replaced. All the TVs were replaced. The DVR was added. The condo was painted. The bedding is new and light and lovely. We are so pleased our guests appreciated all the changes we made. Five-Star Hotel, restaurants, day spa snack bars and night club on the property. Nightly Rate: $250.00-350.00 Weekly Rate: $1000 - $1500 Monthly Rate: $1000 - $1500 Cleaning fee of $150.00. Fifty-percent of rent is required to hold the dates.Tax is not to be collected on a rental over thirty days. If fees are not received within 72 hours reservation will not be held.